If you are like most people, you are in contact with a number of people each day, either in your workplace, school, university, Starbucks, or neighborhood, and you find yourself engaged in conversation on various levels. Usually the conversations are somewhat superficial, a bit about the weather, how the local sports teams fared last night, your plans for the weekend, etc., and of course there is nothing wrong in engaging in casual conversation as this is often what friends and colleagues do. However, if ‘casual’ is all there is to your conversations, then something is amiss, and that is this—you, as a Spirit filled Christian are not like most people, because unlike a person who doesn’t yet know the Lord and are yet to be filled with His Holy Spirit, you do know the Lord and are filled with His Spirit, and as such, you have “received power after the Holy Spirit has come upon you, and you will (are to be) my witnesses…to the end of the earth.” (Acts 1:8 ESV). (If you have not experienced the baptism of the Holy Spirit, please read Luke 11:13 and ask God to fill you with the Holy Spirit today.) And because you are different, in the sense that you are born again by the Spirit of God, (John 3) that sets you apart in a way that is unique within your surroundings. Let’s take a brief sampling of Jesus’ exposition on the relationship that his disciple is to have with the society or culture in which they reside. Remember, no person is an island, or ostrich for that matter. Now, taking the ‘ostrich’ as our example, let’s ask the question, ‘is there anywhere stated or even hinted at, either in the Gospels or the Epistles, a position or worldview that encourages or condones hiding, or treating ones’ surroundings with indifference, apathy or passivity?’ Unless you have a different Bible from mine, we have arrived at the same answer—No, there is no such position or worldview taught. So then, what does the NT teach as to the believers relationship with the world in which they live? “To many of us, the verses of Matthew 5 are becoming increasingly familiar. We see their great importance today, and we begin to look at them again. In the Sermon on the Mount, Jesus proclaims, in verse 13: “You are the salt of the earth.” Verse 14: “You are the light of the world.” Verse 16: “Let your light so shine before men that they may see your good works and glorify your Father, which is in heaven.” (ERV). 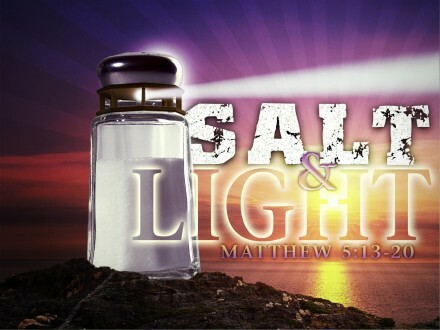 In both these metaphors of the salt and the light, Jesus teaches about the responsibility of Christians in a non-Christian, or sub-Christian, or post-Christian society. He emphasizes the difference between Christians and non-Christians, between the church and the world, and he emphasizes the influences Christians ought to have on the non-Christian environment. The distinction between the two is clear. The world, he says, is like rotting meat. 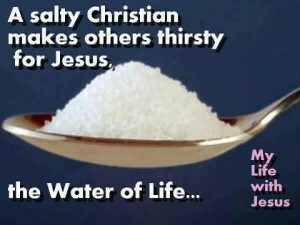 But you are to be the world’s salt. The world is like a dark night, but you are to be the world’s light. This is the fundamental difference between the Christian and the non-Christian, the church and the world. Then he goes on from the distinction to the influence. Like salt in putrefying meat, Christians are to hinder social decay. Like light in the prevailing darkness, Christians are to illumine society and show it a better way. It’s very important to grasp these two stages in the teaching of Jesus. Most Christians accept that there is a distinction between the Christian and the non-Christian, between the church and the world. God’s new society, the church, is as different from the old society as salt from rotting meat and as light from darkness. If we are to be the ‘salt and the light’ that we as professing Christians are called to be, we must be the influence that ‘salt and light’ have on their surroundings, which is a profound one and not a passive or nominal one. So how do we make the transition from survival to influence? Where do we start? 1. Simply unaware (aka clueless)—If you have not been aware of Christian apologetics, or have simply heard about it in passing but with no explanation as to what it is, and how it benefits the believer, both in their personal walk with the Lord, as well as equips them to be an effective, courageous, bold and ‘ready’ witness to others, I am not surprised. Sad to say, many churches, and youth leaders, have a certain bias against apologetics and as such, do not promote them within their congregations. I too went for years without such an awareness, and looking back from my current point of reference, the lack of this unmined wealth of evangelistic tools is a profound regret. I certainly would have been much more effective had the Holy Spirit had these apologetic tools to work with. But as Paul said, “…but one thing I do: forgetting what lies behind and straining forward to what lies ahead, I press on toward the goal for the prize of the upward call of God in Christ Jesus. (Philippians 3:13-14 ESV) So let’s get on with the race—no time to look back now, only to what is ahead. 2. 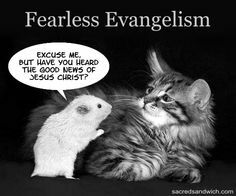 Lack of confidence (aka lack of knowledge and humility) Christ’s ambassadors need the basic knowledge necessary for the task of being an apologist. They must know the central message of God’s kingdom and something about how to respond to the obstacles they’ll encounter on their diplomatic mission. We live in an era of history in which the “embarrassment of riches” are indeed embarrassing, or to put it another way, we have so much in the way of apologetic resources, that we are literally overwhelmed with the vast riches that will enable and prepare us to meet the intellectual and evangelistic challenges of our day. So why are we lacking in confidence in promoting the Christian worldview? Two reasons—lack of study time (aka hard work) and a lack of humility. 3. Indifference—(aka ‘lukewarm’) Sad to say, there are too many Christians today who have not embraced Christ’s Great Commission ‘to go into all the world and preach the Gospel to every creature.’ (Mark 16:15; Matt. 28:18-20), and instead, are in a state of indifference which is nothing more than lukewarmness. This spiritual state is not something to be taken lightly. One only needs to turn to the letters to the churches in Revelation to hear the Lord’s word on this issue—“And to the angel of the church in Laodicea write: ‘The words of the Amen, the faithful and true witness, the beginning of God’s creation. “‘I know your works: you are neither cold nor hot. Would that you were either cold or hot! So, because you are lukewarm, and neither hot nor cold, I will spit you out of my mouth…I counsel you to buy from me gold refined by fire, so that you may be rich, and white garments so that you may clothe yourself and the shame of your nakedness may not be seen, and salve to anoint your eyes, so that you may see. Those whom I love, I reprove and discipline, so be zealous and repent. 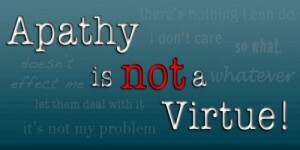 (Revelation 3:14-19 ESV) You can find no such lukewarmness in either Jesus or Paul’s teaching. Jesus said the following to all, (emphasis on ALL) “If anyone would come after me, let him deny himself and take up his cross daily and follow me. For whoever would save his life will lose it, but whoever loses his life for my sake will save it. For what does it profit a man if he gains the whole world and loses or forfeits himself? For whoever is ashamed of me and of my words, of him will the Son of Man be ashamed when he comes in his glory and the glory of the Father and of the holy angels…” (Luke 9:23-26 ESV) And Paul, “while…waiting for them at Athens, his spirit was provoked within him as he saw that the city was full of idols.” (Acts 17:16 ESV) What motivated Paul to address the people of Athens, both evangelistically and apologetically? In his own words, “for Christ’s love compels us…” (2 Cor. 5:14) If we really believe that, “for God so loved the world that he gave his only Son,” then we will go forth as Jesus and Paul went forth in being the ‘salt and light’ of the world via stirring ourselves up and shaking off the fog of indifference/lukewarmness. 2. Get your head ‘out of the sand’ and into the game—see point #2 above—study time is vital, there is no getting around it. One cannot ‘always be ready to give an answer to anyone who asks for the reason for the hope that is in you, doing so with gentleness and respect,’ if you do not know the reason(s) for the hope. (1 Peter 3:15) I would suggest that you begin with the following books, which if thoroughly studied, will equip any Spirit filled Christian with the essentials needed to be a Christian apologist, aka, a more effective witness for Christ. Part 1, here…Part 3, coming soon…God willing.